Boolean Operators are words that connect search terms or key words together to broaden or narrow the results retrieved. In library research they are often used with the library's research databases or the library catalog. The three Boolean operators are AND, OR, and NOT. AND narrows your search results by limiting your results to those that contain both words connected with AND. OR expands your search results by including results that contain one word, the other word, or both words. NOT narrows your search results by limiting your results to those that contain the word you designate before NOT, but not the word after NOT. One way to visualize Boolean Operators is to use a Venn diagram. See below or watch the video to the right. Below are the number of search results returned in Academic Search Complete using each of these Boolean Operators. Some database searches allow you to combine Boolean operators and parentheses or brackets to enhance your search further. Information in these parentheses or brackets is read first. Then the information outside the parentheses and brackets is applied to the search. (college OR university) AND athletics will search for all articles containing "college athletics" or "university athletics" as if you had searched for college AND athletics and then done a second search for university AND athletics, saving you valuable time if you wanted to search for both of these synonyms. Often times these databases will have an Advanced Search feature that may make this process easier to understand and enter. Different databases may treat parentheses and the order of Boolean Operators differently, so if you plan to use them extensively in a particular search, check the database's help features or consult a librarian if you are confused or not receiving the results you believe you should be receiving. 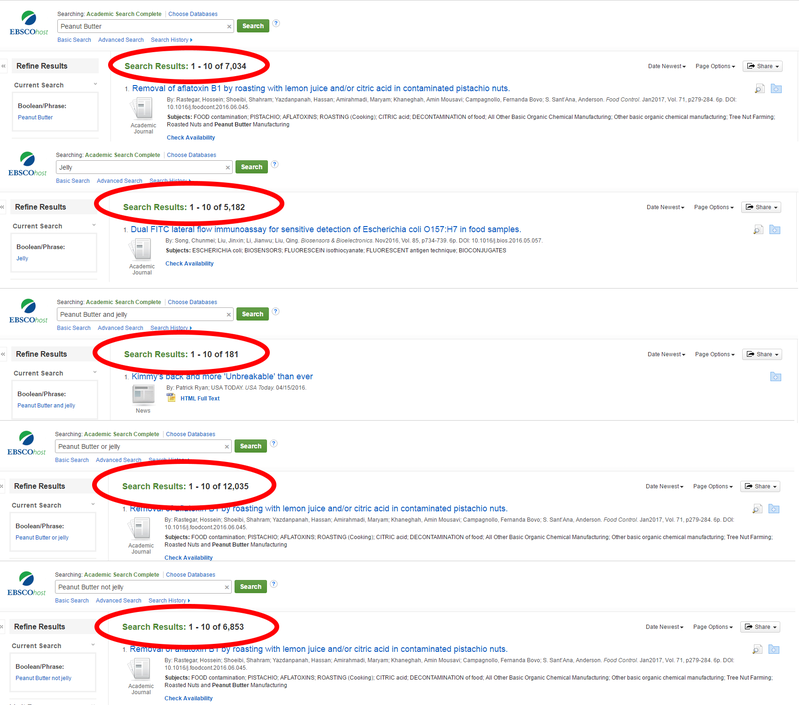 Take a look at the following sandwich related searches in Academic Search Complete to see how this affects the number of search results generated.